In a post Google Penguin era, old school link building has become a thing of the past as SEO’ers realise such techniques offer no short or long term value or ROI. However, there is still confusion about what is considered good and bad practice when it comes to link building. To help clarify, here are 10 possible reasons why your link building may not be working quite as you expected. 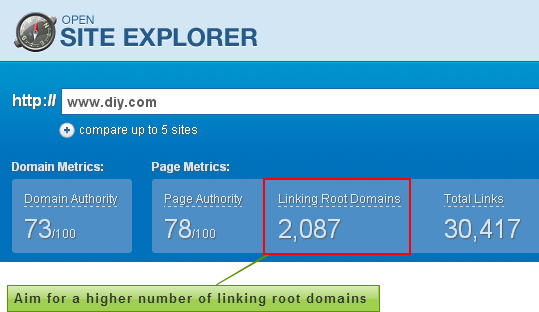 Harping back to the days of backrub, link building rule number 1 says to focus on quality of links not quantity. There are countless examples where one site will outrank another, and a quick glance at the link metrics says it all – quality wins. When gaining links, look at the PageRank (PR) of the donor site and page, and aim as high as possible – around PR4 or above. Remember, inheritance plays a role in PageRank, so by gaining links from higher value websites, you are in effect inheriting some of their own link equity. However, it should be mentioned that PageRank is one of a multitude of other signals entering the SEO mix. Nonetheless, good PR counts for something. If you want to check the PageRank of a donor site, download a free toolbar like SEO Quake or visit one of many PR checking websites. If you’re an SEOmoz subscriber, use their toolbar to understand the authority of the domain or page you are targeting for your link building. SEO practitioners have often debated the differences between followed and nofollowed links and their relative value. For those new to SEO, nofollow links are created by adding a “nofollow” attribute to the HTML link tag thus cutting off any link equity gained via that link. Nofollow links are typically adopted by high value websites or blogs to ward off spammy link builders attempting to gain link equity. 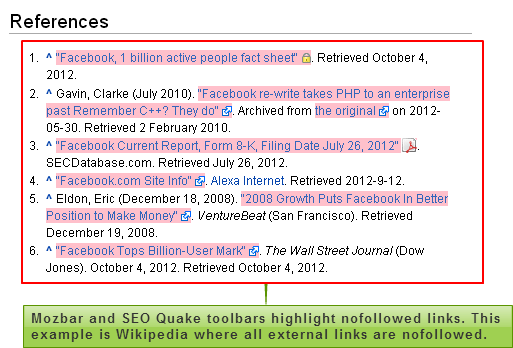 Wikipedia is classic example where all external citations are nofollowed. Given that much of Wikipedia’s content is user generated, it would be too easy to create content with external citations thus gaining some link value. So in an ideal world you will want to gain followed links. Be careful about website owners who are all too keen to offer backlinks; I’ve seen too many examples of nofollowed tactics used to the ignorance of the beneficiary. With Google Penguin now permeating through the SEO community, contextual relevance plays a considerably greater role in link building. Gaining links from contextually relevant websites will not only appear more natural, thus offering SEO value; but equally, you will probably attract visitors who are more likely to engage with your content. So, you win on both counts. There are some real horror stories of old school link buying on a vast array of contextually irrelevant websites at a cost of £000’s for the client. As I mentioned earlier, inheritance plays a role in the original PageRank algorithm and hence link building. Gaining a link from a page with hundreds of outbound links will have less value than a link from a page with only a handful of external links as the inheritance is diluted to the point where it can be valueless. It explains quite simply why many link directories don’t offer value. Aside from their poor PageRank, the amount of links on an average page dilutes that poor PageRank even further. In a bid to seek out (and encourage) naturally occurring links, Google is constantly interpreting link patterns between pages. When external links show contextual similarities i.e. sites 1,2,3 collectively link to A,B & C (because they all share the same subject category), the co-citation pattern will offer rewards. Where outbound links collectively have very little relevance, there’s a chance that the value of the outbound links will be reduced. This comes back to point 3; by gaining links from contextually relevant sources, the chances are that the external links on those sites will follow a similar contextual pattern. Anchor text (defined as the words that make up the link text) has long been confirmed as playing a major role in link building strategies. Gaining links with “click here” as the anchor text will be far less valuable than links that contain a useful search term. The fact that Adobe ranks no.1 on Google.co.uk for “click here” is the best case in point, as it has a multitude of external links offering to “click here” and download the Acrobat Reader. So rule no 1 is to encourage more meaningful anchor text (easier said than done on external links). But, to put a spanner in the works, SEO folk are now musing whether now links should appear more natural. And there is suggestion that over-repetition of the same anchor text could arguably do damage. So just to confuse matters, there is now debate around the (now positive) value of encouraging a few “click heres” and nofollow links to adhere to the new rules. Confused? I don’t blame you. Link analysis tools like Open Site Explorer or Majestic SEO will highlight linking root domains and/or C-class linking blocks. The latter refers to how many diverse IP ranges link to you versus links from the same IP range. Google is known to prefer links from a variety of sources, rather than lots of links from the same source. Dating back to the late 90’s, spammers were known to own dozens if not hundreds of websites with low value content, all sitting on the same server (and IP range) inter-linking in an effort to game the system. Diverse root domains should in theory imply a more natural link profile as multiple sources have cited your content as being worthy. Here, you also have an opportunity to diversify your brand portfolio by building social media pages. Let’s not forget that internal links play a role in (a) enabling a search engine to easily crawl your website and (b) directing the flow of authority throughout a website. A lowly product page that has monetary value for you, sitting deep within a site architecture, may have little authority and hence rank due to its position within your site structure. Citing that product page on a higher value page, such as your home page, as “Editor’s choice” or “Deal of the month” can inject near instant authority, which can be measured over time through an improved search rank for that page. How ironic is it that most of our higher value pages from a sales or lead generation perspective, are sitting deep within our website inheriting little authority? When starting any SEO activity, the first thing to ask yourself is, what am I trying to achieve, and secondly how am I going to measure success? In marketing speak, setting goals and KPI’s. First rule of thumb is to keep a change log of your marketing or web content activity. If you’re using Google Analytics, try creating annotations so that you can track activity and associate it with variations in performance. Make sure you have configured goals in your analytics software in order that you can rationalise conversions and conversion rate with variables such as keywords, search engines, organic versus paid clicks etc. Link building tools like Raven will allow you to monitor links you are “pursuing” versus “attained” and Majestic SEO produces a lost backlinks and backlink discovery report helping you track link acquisition over time. I’ve arguably left the most important till last. The least scientific approach to success in link building relates to the quality of your content also known as link bait. It has been cited time and again by online marketing veterans because it speaks volumes. The definition of link bait is painfully simple. If your content is great, people will follow. There’s little reason for a blogger, journalist or social consumer to cite you or share your content if it isn’t link worthy. So I’m gong to end on this note. Link building is a misleading term. Post Google Penguin, the new link building is link earning. Invest your time, resource and budget in producing great content. It will have a positive long lasting brand effect, it will be your digital legacy and Google will love you for it. And so will your CEO! 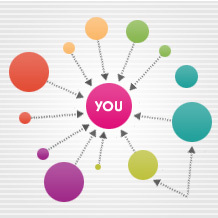 Want to know more about link building? Check out our Advanced Link Building Training Course.